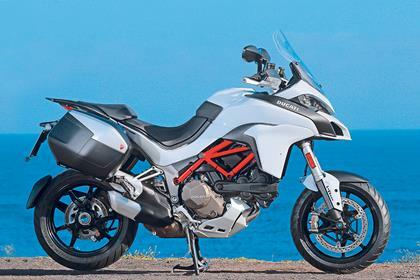 The Ducati Multistrada 1200 S DVT could well be the best-suited bike to the nasty state of UK roads and offers a huge amount to almost everyone. It can keep up with a superbike but be as comfortable as a tourer and is backed by some truly advanced technology. In the UK market the S version of this bike accounts for more than 80% of sales and that bike gets the Ducati Skyhook Suspension which on this bike is an evolution of the Skyhook semi-active and electronically-controlled system fitted to the 2012 model. Pirelli has also developed a brand-new version Scorpion Trail 2 tyre for the Multistrada and on the warm Lanzarote roads they seemed to be a massive improvement over the old version. Despite the size of the bike the handling remains on the sportier end of the adventure bike sector and this bike, thanks to the semi-active suspension can carry serious road pace that will leave sportsbike riders wondering how such a big bike can move so fast.The four riding modes adjust the suspension to suit and even alter ride height. The biggest news is the Desmodromic Variable Timing (DVT) which, despite the name has nothing to do with a blood clotting issue, but is the first constantly variable valve timing system which has a multitude of aims from smoothing out low-rev clatter, boosting high-rev power and all the time maintaining a more constant combustion cycle throughout the rev range which also improves fuel consumption and emissions. At idle the engine sounds quite different to the Testrastretta 11 motor of the previos ‘Strada; it’s softer, quieter and less lumpy. Moving off at the gentlest of revs to try and ‘make’ the engine misbehave results in none of the former engine’s tendency to slap, chug or create that longitudinal shunt between the cylinders that made town riding unpleasant. For some this is going to be loss of character but for everyone else it will come as a relief and Ducati hope it will remove a barrier to prospective owners buying a Ducati. Ducati says it has worked hard to improve the finish of the new Multistrada as the previous two versions of the bike have been known to cause issues; particularly with seizing exhaust valves due to corrosion. The rear brake was also widely regarded as not up to scratch but this has been improved on the new bike and there is a larger diameter rear disc which offers more stopping power. Build quality on the launch bikes was first rate but it will be interesting to see how these bikes fair when compared to the old ones after a British winter on salt-covered roads. 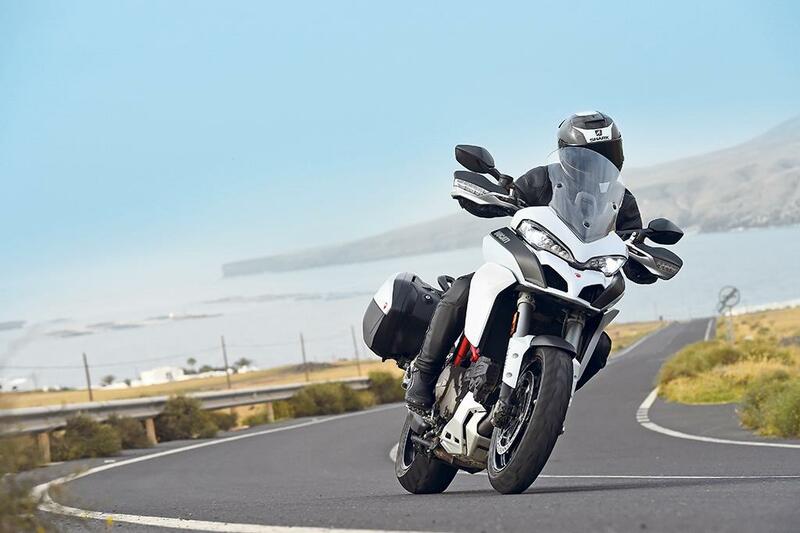 There’s no getting away from the fact the Multistrada 1200 DVT is an expensive bike but for those able and prepared to pay the money the quality and specification of the bike can take away some of the sting. The cheaper, standard model does away with the semi-active suspension but these generally make up for a tiny percentage of the bikes sold in the UK. Ducati owners generally want the higher spec bikes and are prepared to pay for it. 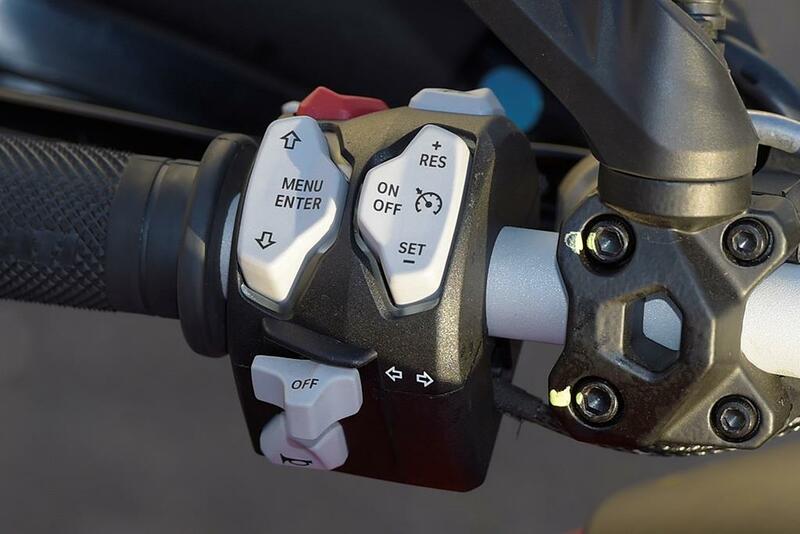 The DVT system is just the start of the technological tsunami packaged up in the Multistrada range. Both standard and S models have a massive range of high technology including ABS with a cornering ABS function, traction and wheelie control, cruise control for the first time, adjustable riding modes, ride by wire throttle control and the S model gets Skyhook semi-active suspension, a full colour dashboard, higher spec Brembo M50 brakes and a full LED headlight with a cornering function and the Ducati Multimedia system too. The Inertial Measurement Unit (IMU) is the electronic system that measures five different axes to measure roll, pitch and yaw angles, lean as well as the rate of change to control everything from the Skyhook semi-active suspension, cornering ABS, anti-wheelie and traction control systems. The S model gets the more advanced dashboard which is a 5in wide TFT display giving information on speed, rpm, selected gear, total mileage, two trips, coolant temperature, fuel gauge and the time. Other information shown varies according to the riding mode selected. Four accessory packs are available; Urban, Enduro, Touring and Sport and they can be mixed and matched according to the owner’s choice. Rear suspension Fully adjustable unit. Electronic compression and rebound damping adjustment. Electronic spring pre-load adjustment with Ducati Skyhook Suspension (DSS). 2010: First generation of Multistrada 1200 was launched and was the first bike to get the new Testastretta 11 engine. 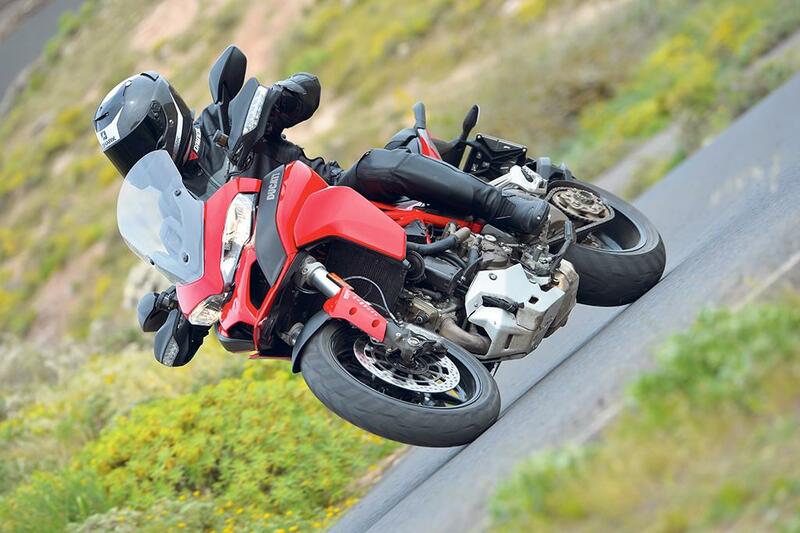 2013: Multistrada 1200 gets Skyhook semi-active suspension and a host of minor upgrades. 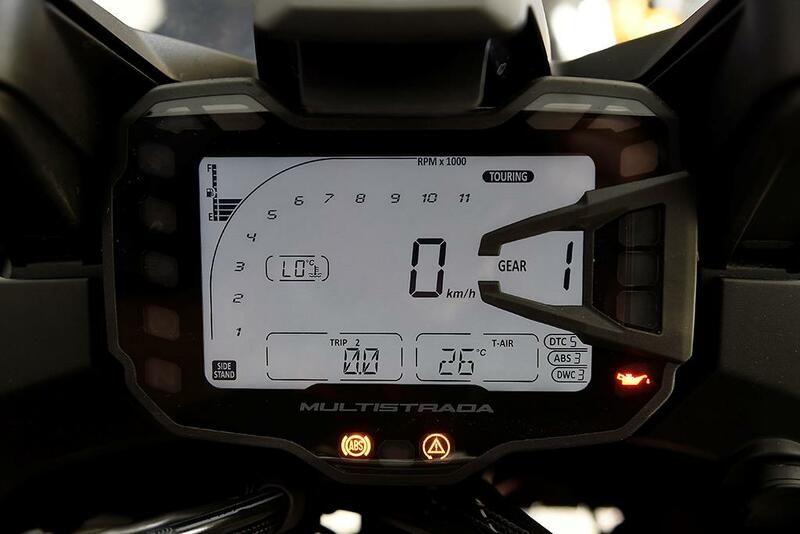 Multistrada 1200 D-Air launched in conjunction with Dainese and incorporates sensors to link up with D-Air airbag jacket. 2015: New DVT engine introduced in heavily revised model. There's also a stock Multistrada 1200, and a Dainese D|Air enabled version of the 1200S. 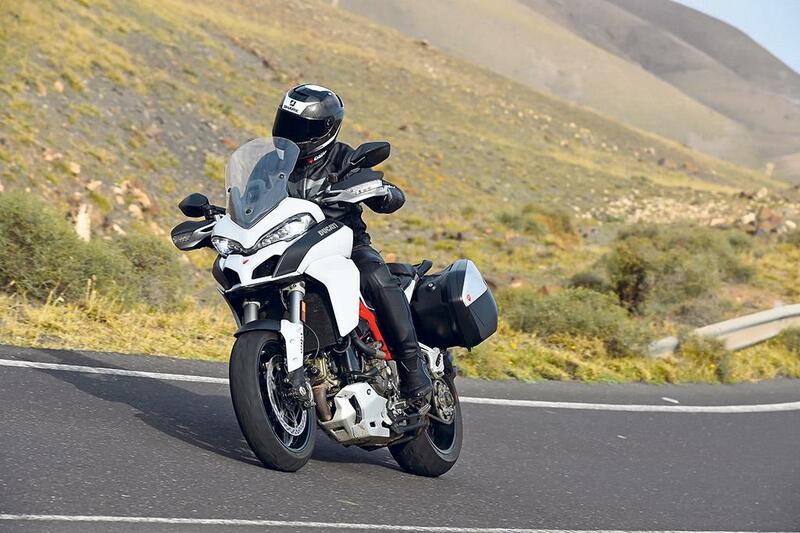 5 owners have reviewed their DUCATI MULTISTRADA 1200S (2015-on) and rated it in a number of areas. Read what they have to say and what they like and dislike about the bike below. Wonderful two-up Tourer that allows itself to be turned into a perfect twisty mountain road bike when you are in the Alps. Comfortable, fast and looks good but let down by poor quality of fixing and seat which is a very poor fit to the bike. Great to ride but overpriced for the quality you're getting. Brembos on base model are okay but no better that my old Suzuki GSX1250. The S version has stronger more expensive Brembos which are very good. Very comfortable for the pillion; my wife is very happy on the back and we've covered many full days touring across Europe. Plenty of power - thrilling when you open her up. Only really pulls hard from 5k rpm upwards. Silencer cover bolts seized after just 18 months so had to drill them out to get a new back tyre fitted (the bike is garaged and not used in the winter). Some metal fittings corrode, fuel sender fails, exhaust valve sticks and has to be bypassed at extra cost (even under warranty). Excellent service for WM Snells, Ducati Alton. Good heated grips, great panniers (look good colour matched) easy to take on and off and no horrible scaffolding to attach them to the bike (a la BMW). Good info on LCD dash. Good from Ryders at Bridgewater. The bike is amazing, do it well on any surface, have try it on landscapes and hard roads and it was ok, then I was on the track and it behave as a sport bike, 195 Km/h on a 520 meters straight. it have a lack of torque between 3000 and 5000 rpm, it is noticeable in every riding mode, it have been solve in the new 1260 models engine that I have tried and its perfect. They should have do something with the old models because they solve the problem for new buyers but the people that already have the bike have nothing to do. sometimes It is hard to start, especially on cold weather, it cranks slow every time, which makes me feel its going to fail. The bluetooth its useless and the dash scratch to easy, not perfect but very close. The service labor is expensive but you pay for profesional service, they change my trhottle with no cost for me (a 400 change). owner of Xdiavel and Panigale 1299. To the best... And to the worse!! Top the comfort and quality ride. Only down is the panniers to the pillion. Everything to like, always available to gas. But in 4 to 6 rpm, cut a like of that boost (Euro IV). Noisy plastics, brakes; Not uniform space in plastics, seat; Front discs corrosion; Sometimes fail to start; Too many times at the dealer to solve the lot of problems. Almost 40€/hr of labor, it is outrageous! Almost 25€/L of oil, it is outrageous! Besides the lower quality of the bluetooth conectivity, and the lack of usability of the cornering lights, everything is top, starting in the suspension. From a dealer and the worst deal made from my history purchase of motorcycles. Always get around 15/20% off. This one only 5%. This is my first venture into a twin engined motorcycle. To put it simply this is the best bike overall I've owned bar none. The bike does everything very well indeed and certainly exceeds in some areas. Single riding for fun blasts right through to two up fully loaded touring, I've found the bike to be extremely easy to handle. Not as smooth as a four or six cylinder engine bike but I find I can readily ignore that and focus on the huge benefits the bike has. Ducati have made a very beautiful bike and have even managed to make it look good with a full complement of luggage and you can't say that about every bike. Overall I would describe this bike in one word - Fantastic! This bike's agility and ability to corner is most definitely the best feature of the bike in my opinion. Even two up it turns in without hesitation and handles like a dream. Always feels planted and focussed and has never appeared to be out of its depth. The seat is comfy enough for an hour or two riding without a break. My pillion reported the bike to be very comfy. The breaks are very efficient on the front and although this years model is vastly improved on last years, the rear brake could be better. There are a couple of weak or flat spots on the acceleration climb that I have noted and on a couple of occasions I have felt a bit underwhelmed. Beware though, the speed is very deceptive. In reality the bike is much more rapid than it can feel when riding it. A glance down at the speedometer will confirm you are travelling fast - very fast! This DVT version is greatly improved on the 2014 version i test rode last year. The engine handles slow traffic in a much more refined way and the quicker you move the happier it feels. Overall the engine is very good and again, two up appears not to affect the performance very much. Make no mistake the engine is excellent but the odd little flat spot is present.  The quality is good but not exceptional as I feel it should be for a bike of this value. Beautiful bike to look at but on very close inspection some attention to detail is lacking 5 star quality. For example some of the fairing parts are not equally matched to both sides of the bike. There was a little more plastic on the bike than I expected (weight positive?). Small niggles but downgraded as a result. Only one first oil change service completed and the cost was in line with the previous BMW bike I had. Expect higher than back street garage bills - it's a Ducati after all! The S version of the bike comes complete with a vast array of accessories. "Skyhook" suspension, cornering ABS, cruise control, heated grips, riding modes, colour screen are all excellent features. A feature that would really enhance this bike would be a quick shifter and I think Ducati have missed a trick here. Surely next years' model will have this added?